Q: What is the expiration period of the 50 MBs of FREE Data? A: 50 MBs of Free data is valid for 5 days. Q: Will I immediately get the 50 MBs of FREE data? Q: Does a new customer have to Top Up on the day that they purchase the SIM to get the 50MB of Free Data? A: No. 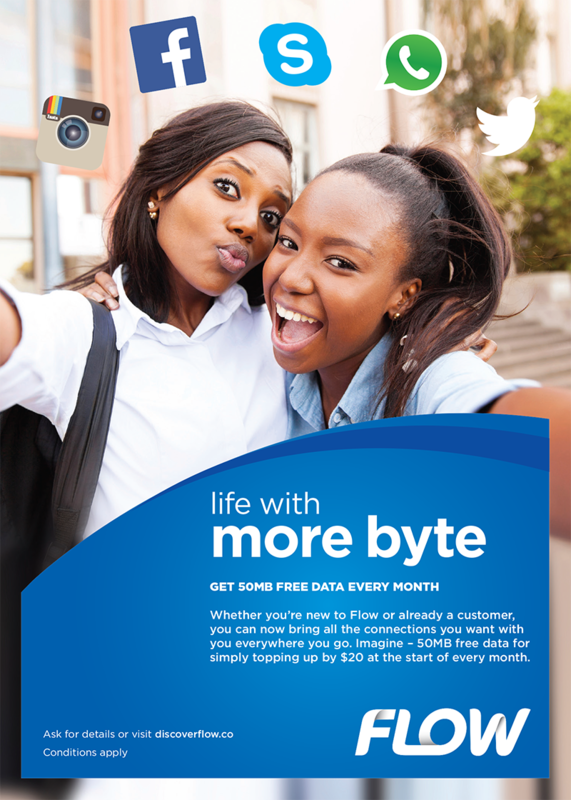 The new customer has until the end of the calendar month to Top up $20 to get the 50MBs of FREE Data. For e.g. if a new customer purchases a SIM on November 15th, they have until Nov. 30th to top up $20 to get the FREE data. Q: Will new customers get a reminder message if they have not taken advantage of the offer? A: Yes. Customers will receive the following reminder notification during the week (normally Wednesdays) if they have not taken up the offer: LIME/FLOW Rewards: Top up $20 or more before the end of this month to get your 50MBs of FREE Data. Q: What can I use my FREE data to do? A: Customers are free to use the 50MBs of FREE data in the same manner as they normally would for any LIME data bolt on or PAYG data service. Q: Can I activate a data bolt on if I have the 50MBs of FREE Data? A: Yes, you can. The 50MBs and the data bolt on balance will both be reflected when you check your balance. For e.g. if you have the 50MBs and activate a 150MB 3 day plan, your new balance will be shown as 200MBs. Q: Can I check to see what my data balance is? A: Yes. You can check by dialling *120# or via the USSD menu *129#. Q: If I top up $20 multiple times, will I get the 50MBs multiple times? A: No. The FREE Data is only applicable on the first top up of $20 during the first five days of the month for existing customers. For new customers, it is applicable on the first top up of $20 before the end of the calendar month.